Merchandise filled the tables of the Lope Shop, which has been busy this week. After Grand Canyon University freshman David Staley moved into his Juniper Hall room, he went shopping. Students and their parents shopped together for GCU shirts and swag. And not for food or staples. 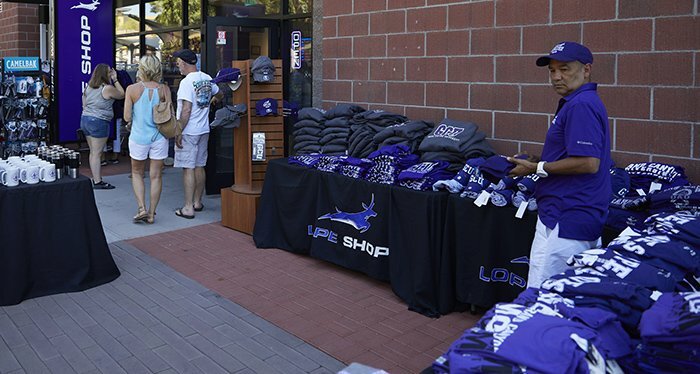 Staley, an engineering major from Modesto, Calif., and his family headed to the Lope Shop, stocked to the rafters with GCU-inspired clothing, bath towels, stickers, banners, water bottles, coffee mugs, key rings, hats, sunglasses, backpacks, pencils and more. GCU students are given purple T-shirts at various events, but most of them, especially incoming freshmen, want to live in a completely purple world. “I already have a few T-shirts but want my wardrobe to go from my high school color blue to GCU purple,” Staley said. For the Lope Shop on Lopes Way, the Team Shop in the Arena and the Hotel Shop in Grand Canyon University Hotel, Welcome Week mimics Christmas at the mall. The stores are packed elbow-to-elbow with shoppers in festive moods and fast-moving register lines that snake to the back of the shop. “It’s a day and a week to show your spirit. We welcome everyone into the shop as if they are a guest in our home,” said Shelly Schrimpf, Operations Manager for the stores. Vanessa Rico, a freshman exercise science major from Southern California, shopped for GCU stickers and T-shirts. “I’m just buying a few things today but expect to add a lot of purple to my wardrobe,” she said. 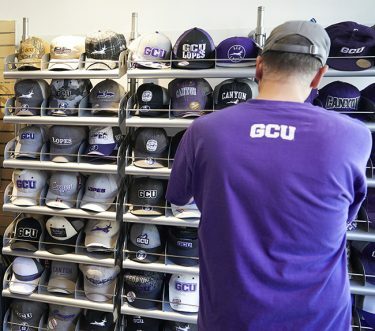 There’s no shortage of GCU hats to choose from. The shop’s best seller, however, is a gray, long-sleeve T-shirt with GCU and its logo in purple. “The shirt is our bread and butter. We have so many different styles, but students like the ones with the basic GCU logo,” said Schrimpf, who expects the three shops to rack up record sales this week as nearly 11,000 students move onto campus. Mary Livingstone, mother of freshman Andrew Martin of Murrieta, Calif., was just such a customer, buying a coffee mug emblazed with “GCU Dad” to take home.